medical tunic Columba is with short sleeves and a boat neck. It falls freely as it is not taken in at the waist and has two front pockets. It is fastened with hidden buttons. It is usually preferred in a combination of two colours so when placing an order, please choose the main colour of the tunic. We will contact you after that to specify the secondary colour. If you wish, it could also be made in one colour only. trousers Pavo have an elastic belt and two front side pockets. They could be made with a front edge with a stitch, if you like. PAVO is available in a wide range of colors. 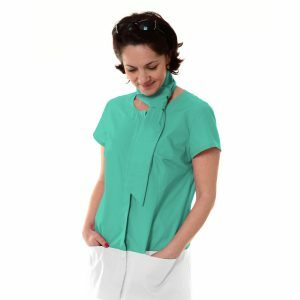 Gugla’s Medical Uniform COLUMBA/PAVO is perfect for a uniform for a dental clinic, medical center, or a hospital as it is very comfortable and pleasant to wear on a daily basis. We provide embroidery so that the uniform could be personalized for your company with your company logo and/or name. For more information, please, visit EMBROIDERY. 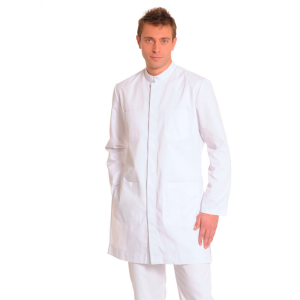 Due to its modern design and comfortable and pleasant fabric it is made of, lab coat INDUS is preferred by many hospitals, medical centres, and dental clinics all over Europe. We provide embroidery so that it could be personalised for your company with your company logo and/or name. For more information, please, visit EMBROIDERY. When placing an order, please choose the main color of the tunic we will further contact you to specify the secondary color. 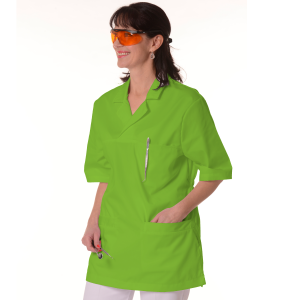 Women’s Tunic for Work PUPPIS is extremely suitable for a uniform. We provide embroidery so that it could be personalized for your company with your company logo and/or name. For more information, please, visit EMBROIDERY. tunic Columba is with short sleeves and a boat neck. It falls freely as it is not taken in at the waist and has two front pockets. It is fastened with hidden buttons. It is usually preferred in a combination of two colours so when placing an order, please choose the main colour of the tunic. We will contact you after that to specify the secondary colour. If you wish, it could also be made in one colour only. Ladies’ Work Uniform COLUMBA/PAVO is perfect for an everyday uniform as it is very comfortable and pleasant to wear on a daily basis. We provide embroidery so that the uniform could be personalized for your company with your company logo and/or name. For more information, please, visit EMBROIDERY. edge of collar and sleeve in color of choice. 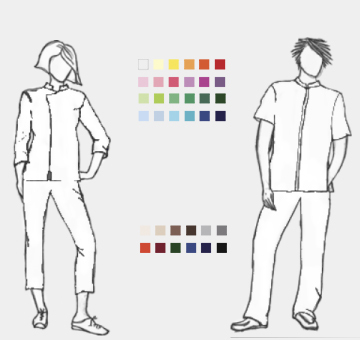 Different combinations between the basic color of the tunic and the collar edge of the collar and sleeve edge are possible. 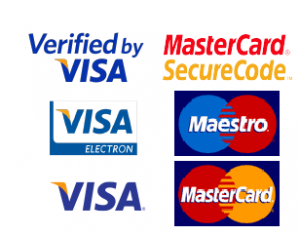 When ordering, you choose the basic color, then we will contact you to specify the second desired color. 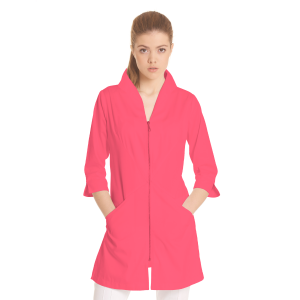 The CARTER tunic model is very comfortable and modern. We provide embroidery so that it could be personalized for your company with your company logo and/or name. For more information, please, visit EMBROIDERY. 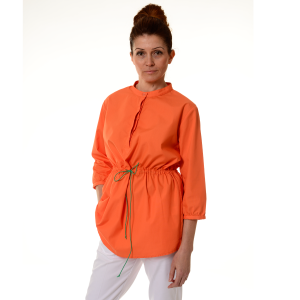 Tunic CARTER has short sleeve, stool collar, one upper inner pocket with tic button.Has a hidden front zip, and ends with a hipstick. There is a possibility of a combination of two colors. Dressing through the head. trousers Draco have an elastic belt. There is a rear outer pocket and two front side pockets and an opportunity to be made with stitch leading edge. Available in a wide range of colors. Men’s Work Uniform CRATER/DRACO is perfect for an everyday uniform as it is very comfortable and pleasant to wear on a daily basis. We provide embroidery so that the uniform could be personalized for your company with your company logo and/or name. For more information, please, visit EMBROIDERY. 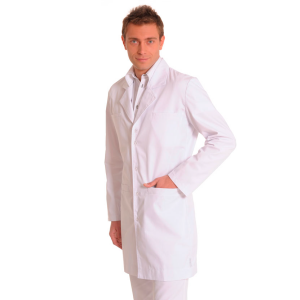 Due to its modern design and comfortable and pleasant fabric it is made of, lab coat PEGASUS is preferred by many hospitals, medical centers, and dental clinics all over Europe. We provide embroidery so that it could be personalized for your company with your company logo and/or name. For more information, please, visit EMBROIDERY. It could be made in one colour only. It is preferred in a combination of two colors. we will further contact you to specify the secondary colour. 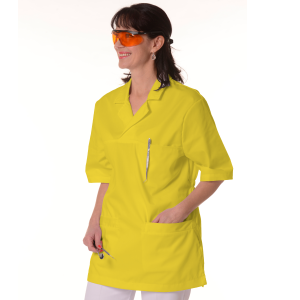 Workwear tunic VELA is extremely suitable for a wide variety of work uniforms including office workwear, hotel uniforms, restaurant uniforms, etc. We provide embroidery so that it could be personalised for your company with your company logo and/or name. For more information, please, visit EMBROIDERY. 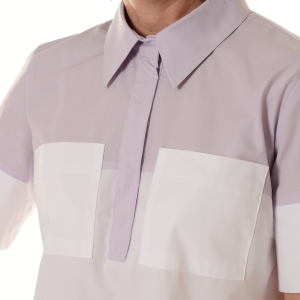 top Dorado Women is a short-sleeved tunic with one top pocket and two bottom pockets that are hidden. It is taken in at the waist at the back and it has side slits. It is put on through the head. Women’s Work Uniform DORADO WOMEN/PAVO is perfect for an everyday uniform as it is very comfortable and pleasant to wear on a daily basis. We provide embroidery so that the uniform could be personalized for your company with your company logo and/or name. For more information, please, visit EMBROIDERY. 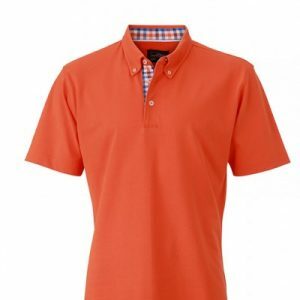 Men’s Polo Shirt JN 964 is suitable for a casual uniform. We provide embroidery so that it could be personalized for your company with your company logo and/or name. For more information, please, visit EMBROIDERY. 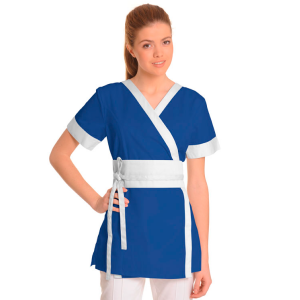 Women’s Medical LIRA is extremely suitable for a healthcare uniform uniform as it is very convenient to wear on a daily basis. We provide embroidery so that it could be personalized for your company with your company logo and/or name. For more information, please, visit EMBROIDERY. 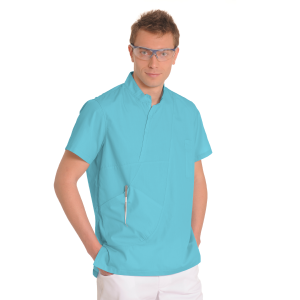 Medical Tunic VELA is extremely suitable for a uniform for a dental clinic, medical center, or hospital. We provide embroidery so that it could be personalised for your company with your company logo and/or name. For more information, please, visit EMBROIDERY. 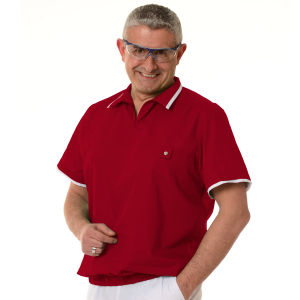 Men’s Work Tunic Aries is very comfortable and pleasant to wear on a daily basis. We provide embroidery so that it could be personalized for your company with your company logo and/or name. For more information, please, visit EMBROIDERY. The thread could be white, red, orange, yellow, pink, brown, light green, dark green, light blue, dark blue, grey or black. When placing an order, please choose the main colour of the tunic. We will further contact you to specify the colour of the thread. 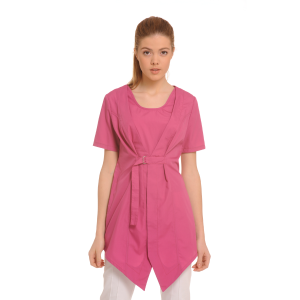 Ladies’ Tunic for Work ANDROMEDA is extremely suitable for a work uniform as it is very convenient to wear on a daily basis. We provide embroidery so that it could be personalised for your company with your company logo and/or name. For more information, please, visit EMBROIDERY. 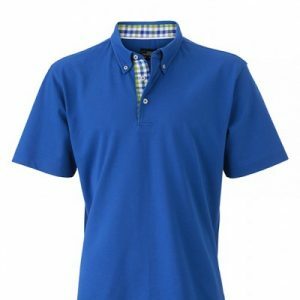 top is made of tricot, has a short sleeves, V-shaped neckline, and is slightly taken in at the waist. It is put on through the head. trousers are made of tricot, with an adjustable belt with a button. 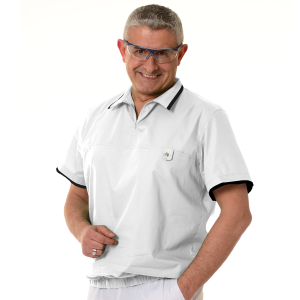 apron is short with two front pockets and a belt with laces. Women’s Work Uniform VOLANS is perfect for a daily uniform as it is very comfortable and pleasant to wear on a daily basis. We provide embroidery so that it could be personalized for your company with your company logo and/or name. For more information, please, visit EMBROIDERY. white coat Norma has 7/8 sleeves with slits, a collar, two hidden front pockets and is fastened with a metal zipper that can be zipped both from the top and the bottom. It is flared from the waist down. Women’s Work Uniform NORMA/PAVO is perfect for an everyday uniform as it is very comfortable and pleasant to wear on a daily basis. We provide embroidery so that the uniform could be personalized for your company with your company logo and/or name. For more information, please, visit EMBROIDERY. 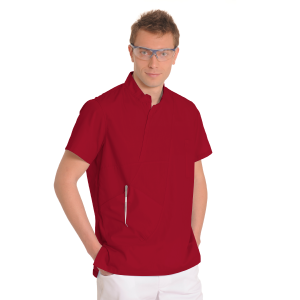 tunic DORADO has short sleeve, rever collar, one upper and two lower inner pockets. It has side slits. Dressing through the head. 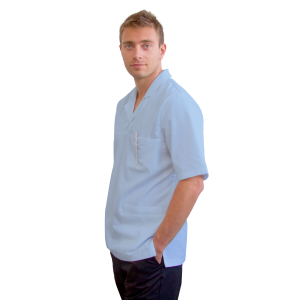 Men’s Medical Uniform DORADO /DRACO is perfect for a uniform for a dental clinic, medical center, or a hospital as it is very comfortable and pleasant to wear on a daily basis. We provide embroidery so that the uniform could be personalized for your company with your company logo and/or name. For more information, please, visit EMBROIDERY. 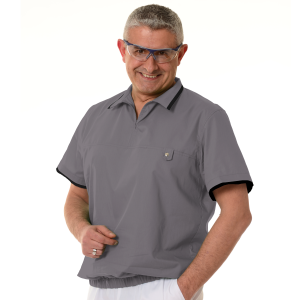 Due to its modern design and comfortable and pleasant fabric it is made of, lab coat GEMINY is preferred by many hospitals, medical centers, and dental clinics all over Europe. We provide embroidery so that it could be personalized for your company with your company logo and/or name. For more information, please, visit EMBROIDERY. When placing an order, please choose the main color of the shirt. We will further contact you to specify the second color. Shirt for women FORNAX is extremely suitable for a uniform. We provide embroidery so that it could be personalized for your company with your company logo and/or name. For more information, please, visit EMBROIDERY.